Earlier this month, NASA scored a major victory with the flawless launch of the Orion prototype spacecraft. The space agency has now released a thrilling new video showing an astronaut's-eye view from the crew module's window as it returned to Earth. There was no one aboard Orion during its inaugural flight, but test flight video was recorded through windows in the crew module. 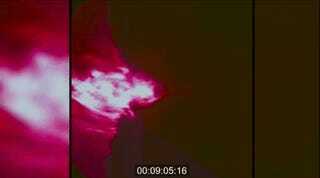 Some of the video was previously shown on NASA TV, but not in its entirety. 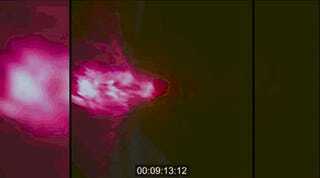 There was also a blackout period caused by the superheated plasma. The action gets started ten minutes before Orion's 11:20 AM EST splashdown in the Pacific Ocean on December 5. This is the moment when the Orion crew module first starts to make contact with Earth's atmosphere. Over the next two minutes, you can see the effects on the heat shield as it grazes the atmosphere at a blazing 20,000 mph. Hot ionized gas surrounds Orion, while plasma created by the interaction changes from white to yellow to lavender and finally to magenta as the temperature steadily increases. "Peak heating" is achieved some time around the two-minute mark of the video. Things tend to settle down appreciably after that. Starting at the 3:07 mark, the reaction control system kicks in, firing jets that steer Orion to a 6-mile wide landing target in the Pacific. These appear as puffs of smoke on either side of the craft. At the 5:30 mark, the forward bay cover is jettisoned to expose eight parachutes that gradually slow Orion down to 20 mph. The main parachutes are fired at 6:32 and splashdown happens at 10:16.